Present Through Subjunctive - Learn Complex Spanish Verb Systems in Fast Easy Sentences. 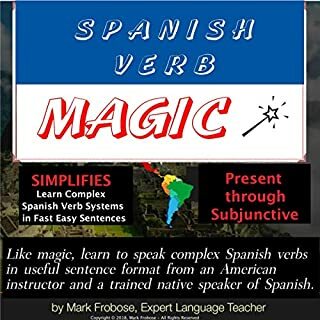 Like magic, learn to speak complex Spanish verbs in useful sentence format from an American instructor and a trained native speaker of Spanish. 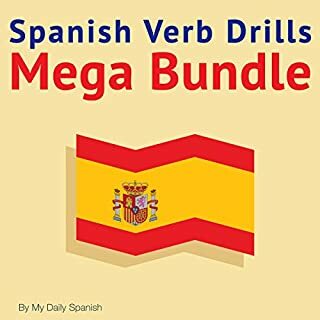 Want to break free of boring drills and canned phrases and create and speak your own original sentences in Spanish with phenomenal speed and ease? Say hello to Spanish Sentence Magic! 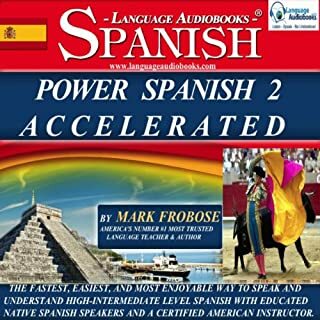 Here are just a few features of this fabulous program: High Frequency Vocabulary - Learn to speak the most common words and phrases that are easiest to learn and quickly understood by native Spanish speakers. Fast Sentence-Building Templates - Use cookie-cutter templates that you customize to fit your own unique language needs. Degreed Educated Native Spanish Speakers from a Variety of Latin American Countries - Hear more than one accent and learn to create and speak original high quality Spanish that will be instantly understood by native Spanish speakers everywhere. Periodic Memory Technique - Automatically retain more of what you learn with this built in memory review system that is already included in the program. Learn On the Go - Even a few minute wait at a red light can give you the time to learn a new Spanish sentence with this magical program. If you could sum up Spanish Sentence Magic in three words, what would they be? I think that Spanish Sentence Magic should be REQUIRED LISTENING in every high school or college level one and level two Spanish class. Here's an English example of how this great Spanish sentence building program would work if you were learning English: It teaches you / It teaches you to speak / It teaches you to speak and understand / It teaches you to speak and understand Spanish. Language Audiobooks does it in increments. In easy-to-understand building blocks that you can customize yourself for original communication in Spanish. There is a very clear explanation of what is coming up right at the beginning. Immediately you start to make short but complete original sentences that cover dozens of topics: eating, sleeping, wanting, liking, doing, going, and so forth. Building on these simple, concise sentences (I want to eat, I want to go, I want to order, I want to do, and so on) the teachers then lengthen them: I want to speak with you; I want to do it now/right now/later; I want to see/I want to see something new; I would like to eat/I would like to eat something else. With simple nouns and verbs as your sentence foundation you are taught to add words and phrases so that you can say longer and more sophisticated sentences. Your own sentences. The words are phrases that you learn all apply to a wide variety of real life conversation situations. 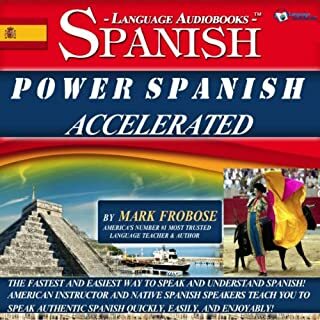 Language Audiobooks also puts out a program called POWER SPANISH CONVERSATION – INTENSIVE. The INTENSIVE program is a perfect follow-up to this Spanish Sentence Magic program. I was a little afraid that the INTENSIVE program might be too much for me, but Spanish Sentence Magic prepared me well enough to be able to handle the INTENSIVE program pretty well. 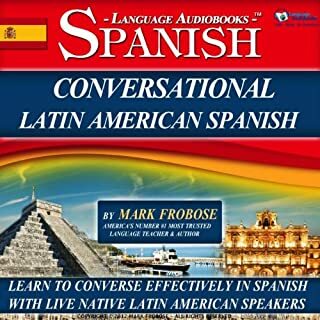 Feel free to read my review of the POWER SPANISH CONVERSATION - INTENSIVE audio program. 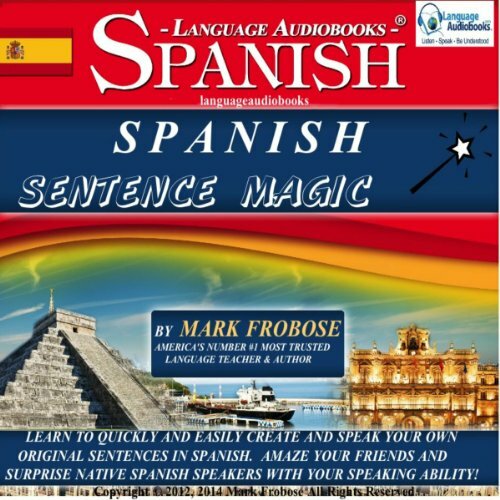 In the meantime, if you are not already at a strong intermediate or at an advanced level you should get this Spanish Sentence Magic program right away. Fabulous program that taught me how to create very simple Spanish sentences right away. Mark (this guy is a master teacher who actually created all the language programs for Macmillan Audio of NYC and his native Spanish speaking assistants guide you though all of this so that you're speaking your own sentences in Spanish right away. Please remember that I have tried virtually every approach and nobody else has anything close to this. This stuff is great and super cheap. Eat your heart out Paul Noble. I especially loved the Audio Snapshots because they give you a clear heads up of the material that's going to be covered later on and kicks off a memory technique that helps you retain what you've learned..
And no guessing. English right away so you're not left scratching your head. And the native accents are from Mexico and all over South America. Highly recommended. Great way to practice and brush up on Spanish before traveling. Best to have some foundation first though. 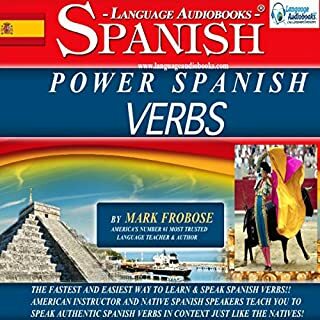 Where does Spanish Sentence Magic rank among all the audiobooks you’ve listened to so far? I would recommend this to anyone at the beginning stage of learning Spanish. Excellent! this book has really helped in my Spanish journey. I highlyrecommend it to you all.